I’ll be the first to admit that I had expectations for this book - high expectations. Yet, the reason they weren’t met doesn’t lie with the fault of this book entirely. I feel as if many other readers will truly love Ironskin, and they should. It has a lot to love, but somehow, it wasn’t the right book for me. For one, Ironskin is a based quite loosely off of the story of Jane Eyre, a classic by Charlotte Bronte that happens to be one of my favorite novels ever. Thus, there was quite a bit of comparisons I couldn’t help but make with it and consequently, I found that Ironskin simply didn’t live up to the literary masterpiece that Jane Eyre was and frankly speaking, I don’t blame it. It is a near impossible task to challenge the work of an author such as Charlotte Bronte and while I admire Connolly for her creativity and attempts at distinguishing her gothic romance from that of Bronte’s, I think avid Jane Eyre fans will be disappointed. First and foremost, I must give credit where credit is due. 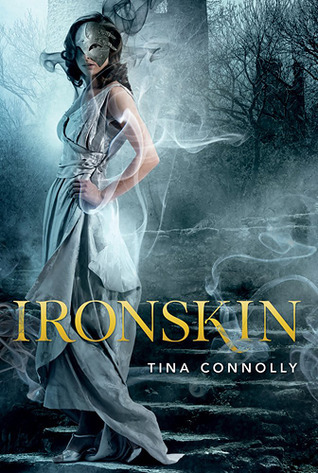 I loved the world-building ideas that Connolly created surrounding Ironskin, - a world where war with the fey had cursed many war victims, leaving them with no option but to wear an iron mask, covering their curses and preventing them from spreading to other victims. Furthermore, I admired the fact that Jane, our protagonist, was a survivor and remained strong despite her constant estrangement from society due to the iron mask that adorned her face. In addition, I even enjoyed how thoroughly Connolly immersed us into her world, bringing forth cultural sayings and superstitions surrounding the fey. Yet, for all these wonderful concepts, I was still quite unable to completely grasp many aspects of this universe and was left with many questions by the end of the novel. In fact, I am still unsure of exactly how the Great War between man and fey began, why the fey withdrew from it so mysteriously, and exactly what purpose it served to the story either than the obvious conclusion of needing a reason for Jane to become an Ironskin. That being said, I did appreciate Connolly’s efforts to distinguish her story from Jane Eyre. Jane, the protagonist of Ironskin, is very similar to Jane Eyre herself, yet while Jane’s governess duties are not an extremely important part of the plot, they are here. Dorie, Jane’s charge, is a young girl whose mother was cursed by the fey and as a result, she possesses a few fey abilities herself. Thus, Jane must help the girl while simultaneously figuring out the enigma that is her employer, Mr. Rochart. Yet, while Jane is an acceptable character and the secondary characters in the house she resides are quite amusing, as well as Dorie herself, Mr. Rochart fails quite miserably to live up to the Mr. Rochester of Bronte’s novel. Not only is the romance between Jane and Edward Rochart vastly under-developed in my opinion, Rochart himself is portrayed as more of a confusing madman than Rochester ever was. Furthermore, I didn’t think that Rochart’s “big secret” was as much of a surprise as Rochester’s was and it most definitely did not have the desired effect on neither his character nor the plot itself. Thus, I found myself to be rather disappointed as the novel progressed and wondered both why Jane loved Rochart and how Rochart could love Jane when he spent so little time with her. Leaving those qualms aside, I found some areas of this narration to be rather slow and didn’t particularly like the direction the novel took towards the end. In addition, I felt as if Jane had too many light-bulb moments that both seemed unrealistic and ruined the pacing of the story as it suddenly made events happen too fast. Furthermore, but the end of this story, I was unable to find a purpose to it. It is clear from the synopsis itself that beauty and appearance in a large factor to this tale and while I was enjoying the developing message of true beauty that I believed to be emerging, some of the events during the end of this story quickly tossed aside that theme and left the novel hanging, not only on a cliffhanger ending, but also in a state of confusion and I could not figure out the point the story had been trying to make in the least. It felt, ultimately, as if the parts emphasizing Jane’s strength in relying on her character opposed to her beauty to get ahead in life were simply crushed and the already unconvincing romance between Jane and Rochart lost me that much more, so I found that all to be extremely disappointing. Nevertheless, there were still distinguishing aspects of Ironskin. I’ve already mentioned the originality of this tale, but I also enjoyed the comparisons between Jane’s life and that of society during that time, so while this novel didn’t have the political scheme I was hoping for from The Great War, it did have social politics mixed in, which nicely added to the culture of the setting. In addition, I thought the relationship between Jane and Dorie was extremely well written and developed and I particularly loved reading about Jane and her wealthy sister and how they compared their lives and hardships. It enabled the reader to see both sides of the multiple situations during their time period and was another convincing relationship. Yet, for all its originality, Ironskin simply failed to live up to my expectations. I believe that other readers will immensely enjoy this gothic tale and most probably will not experience the difficulties I did, unless, of course, they are avid Jane Eyre fans, which is why I would still recommend this one. However, if you love Jane Eyre, you will be prone to comparing this story with the classic it has been built upon and, like me, will most likely have your hopes crushed. Thus, while Ironskin remains to be an intriguing novel on its own, it is, by no means, a novel for me. Thank you to NetGalley and Tor/Forge Books for providing me with a copy of this book in exchange for a honest review. Hmm, Jane Eyre never was my favourite Bronte novel (I was in love with Wuthering Heights) so I wonder if I would be less disappointed than you were by the romance? I'll be reading this soon, so I'm deliberating whether I'll enjoy it or not.. Hopefully I'll like it, but the slow pace and lack of 'purpose' will bother me I imagine. I think avid Jane Eyre fans will be disappointed. I'm filled with shame to admit I have never read Jane Eyre *hangs head* so I'm interested to see if I'll like this better than you since I won't have anything to compare it too. Sorry to hear it failed for you though, especially since you were clearly excited about it! The too-many-light-bulb-moments and lack of purpose does worry me, though the worldbuilding does sound incredible. Fantastic review, Keertana! How is it that, even when you dislike a book, you manage to write such a breathtaking review? Bad books just don't inspire me to write! I can see why you'd go into this with big expectations. That cover alone is enough to lure me in, but all things considered, I think I'll skip it, even if I am a sucker for original worldbuilding. (In reality, I'm just too scared of the fae to read this. I had no idea this was a Jane Eyre retelling (of sorts)! I haven't read the original so I'm thinking I won't have any issues with drawing comparisons:) I'm not sure what to think of this book, the synopsis makes me want to pick it up immediately, but I don't like to be left with a lot of questions about a world, so I'm on the fence I think. You wrote a beautiful review as always though Keertana! Confession as you probably know, I've never read Jane Eyre. Although I've watched one of the film adaptions... So I wouldn't call myself a fan (as of yet). So hopefully that might move in my favour when reading this book. Still, it sounds like it has some strong positives and I like the idea of originality with the Ironskin, although it's a shame that you don't really understand what led to that. I can see that will probably annoy me. Oh dear, the romance sounds badddddd! And I do love a good romance. Well, I still think I'll give this one a shot and I thought this review was fairly concise for you Keertana, and I read EVERYTHING! ;) haha. Thanks for the honest review! I love Jane Eyre and this book was on my radar, but perhaps there are other books that are more worth my time. I agree that many times it is difficult for retellings of classics or popular stories to live up to the original, but it is always so disappointing when that is in fact the case. I just haven't had the opportunity yet although I just bought Wuthering Heights last weekend. So maybe Ironskin would work better for me. I plan on reading Jane Eyre though very very soon. Like right now cause I'm so ashamed of myself. Haha! I haven't heard much about this so I had no idea it was a retelling of JE and while I'm sure I read it for high school I don't have much memory of it. It sounds like this book tried really hard but we can't click with every book we red unfortunately! Great, honest review, hun!